Eventide has a long history in the pro audio industry, both with state-of-the-art software and hardware products musicians and engineers have trusted for years now. We’ve reviewed plenty of plugins at All Things Gear, but the Eventide Fission is different. With its ability to separate the incoming audio signal between its transient and tonal sound aspects, and the ability to apply effects to them separately, the Fission is the perfect tool to use when you are seeking to apply a more detailed approach to your engineering. In terms of design, the Eventide Fission plugin, simply put, is incredible. Early Eventide software releases have seen knobs and other design elements made to look similar to their hardware counterparts — an approach that makes those plugins look a little unclear, and frankly tacky. The moment you open up the Eventide Fission, the plugin’s instructions become immediately clear and concise. You’ll see two separated sections placed at the top and bottom referring to the given sound’s transient effects (in blue), and tonal effects (in green). The color coding seems a minor detail, but in the grand scheme of things it dramatically improves efficiency of use. There have been many times we can recall opening a brand new plug-in, and having it seem overbearing or not knowing where to turn for what feature. This seemingly small detail overrides that issue, and brings you one step closer to finishing your work on the track you are working with. The middle section of the Eventide Fission marks the structural split, which is naturally adjusting the mix or blend of the two effects you are working with. This is most prominently shown in the slider labeled “Focus”. In the structural split section, there are also knobs to adjust the “Smoothing” and “Transient Decay” aspects of your blend. Just below those is the option to select what type of instrument track you are working with. The overall experience when working with the Eventide Fission plugin, is extremely positive. We worked with and tested the plugin on a variety of instruments, and found great success with each one — in fact, there’s very little going against this plugin at all. As far as we know Eventide is the first company to release a structural split editor for transient and tonal aspects of an incoming signal all in one simple plugin. Every knob and slider you can use are easy and smooth and the graphics of the transient and tonal waveforms appear to represent the incoming signal accurately and without delay. From a sonic standpoint, the Fission takes away no more sonic clarity than any other plugin Eventide has released — which is very little. You can rest assured knowing that what you hear coming out of the plugin will take no major hits to detail, or other important factors of your audio. Eventide has obviously taken much care in the creation process to make sure any adjustments you make with the structural split editor can be tuned as finely as possible. That makes sense — Eventide is a powerhouse name in the audio world. The Eventide Fission is the perfect plugin for the producer or engineer who wants to break their audio signal editing down to the fine transient and tonal details. It’s an idea that no other company to our knowledge has attempted, and Eventide has executed their idea resulting in the perfect plugin for this case. 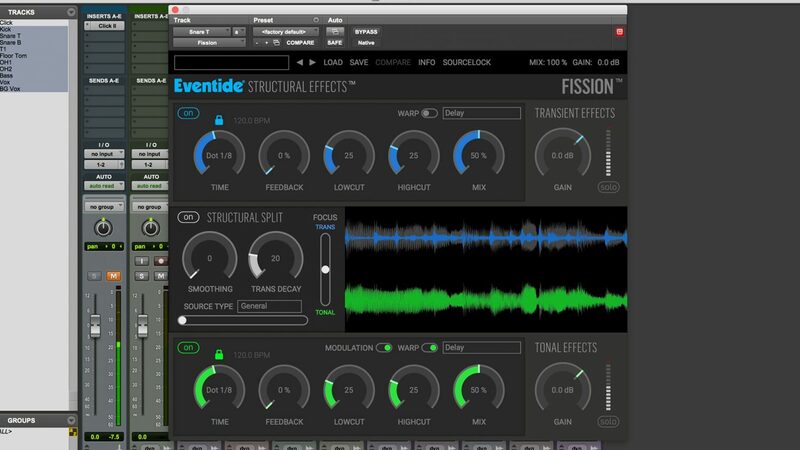 The Eventide Fission is a piece of software that should be in everybody’s studio plugin folder, and is currently listed at $179.00 on Eventide’s website. Sure, that’s a lot of money — but for what you’re getting you won’t regret it.